I started reading Northrop Frye (I discuss one of his books here) when I mentioned to a colleague that, for my lecture on Christianity and classical mythology, I had a final slide called ‘The Myth That Came True?’ He told me about how he discusses Frye’s book Words with Power in his class about theories of myth. Frye is neither here nor there for this post, though. The idea of Christianity as the myth that came true is one associated with that group of creative thinkers and writers, the Inklings. It most famously comes up in the story of C S Lewis’ conversion from theism to Christianity. He was walking in one of the Oxford gardens with friends and fellow Inklings J R R Tolkien and Hugo Dyson about myth and truth and suchlike things. Lewis’ feeling at the time was that all that he found beautiful was untrue, and everything he believed to be true was grim. The myths, such as the Baldr and Adonis, were beautiful but ultimately empty and meaningless, not bearing truth. 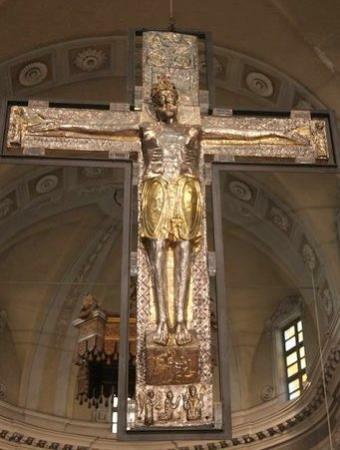 These gods who die and rise, then, from Osiris in Pharaonic Egypt to Baldr in Viking Norway, are at a certain level shadows of Christ, but ultimately not the real thing. Mythology, which is the basic mode of speech of all civilization (and here I cite not merely Frye, Words with Power, but Barfield (an Inkling! ), Poetic Diction), is itself an approach to divine revelation — a sort of storytelling version of St Justin Martyr’s philosophical logos spermatikos. Not only in philosophy but even in mythology has the Word of God hidden Himself only to be fully manifest in Jesus Christ. J R R Tolkien’s idea of eucatastrophe from his essay ‘On Fairy Stories’ is another place where we see the mythic ordering of salvation history. Eucatastrophe is when everything goes horribly, horribly wrong, only to save the day. It is common in the best fairy stories, indeed, the best stories, according to Tolkien. The eucatastrophe par excellence is the death of Jesus on the cross. God dies. The Messiah is slain by foreign enemies having been betrayed by his people. And as a result, by his wounds we are healed. These men did not simply think of myths in the way my colleagues and I like to problematise them in classes on Greek and Roman mythology. Sure, mythos is simply ancient Greek for story; Lewis and his colleagues all know that. But Lewis, having admitted that in the chapter on myth in An Experiment in Criticism goes on to discuss those particular stories that have a certain hold on us, many of which are repeated in different cultures. There is something powerful inherent in Orpheus and Eurydice, regardless of who tells us, whereas The Odyssey needs Homer’s poem. This mythic mode, the sort also sought by their younger contemporary Joseph Campbell, is common to all cultures. And Christianity takes up the mythic mode and, rather than it being fabula makes it into historia — the stuff of flesh and blood, something you can stand on and rely on. It is beautiful and true. This past Tuesday, December 2, was the second time Elder Porphyrios’ (1906-1991) feast was celebrated. It’s rare to have someone so recently canonised appear here, but I felt he was worth commemoration partly because of that fact — and because of his wisdom and holiness of life. 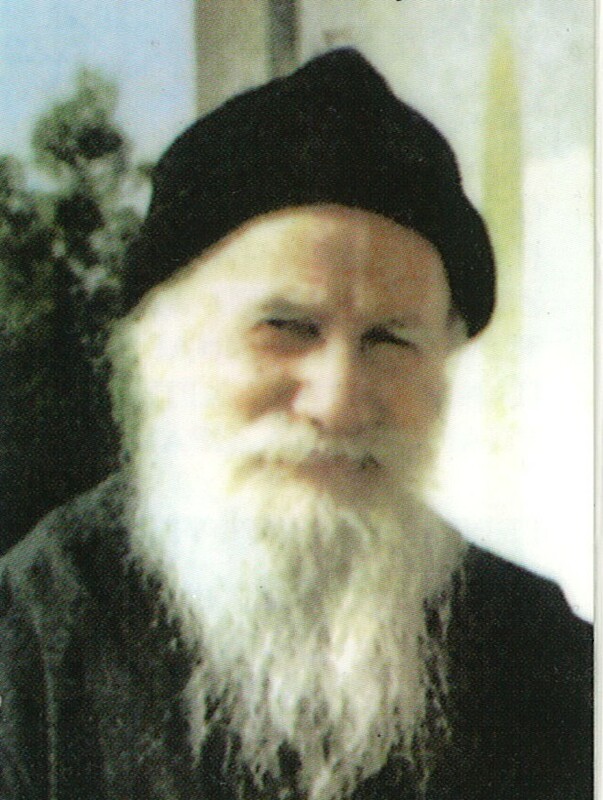 Elder Porphyrios was born Evangelos Bairaktaris in the village of Aghios Ioannis in the province of Karystia on the Greek island of Euboea (mod. Evia). The youngest of four, he left school after the first grade and worked in the town of Chalkida at a shop to make money for the family. He was a hard and obedient worker, and stayed there for a few years before moving to Piraeus on the mainland (it is Athens’ port) and working in a general store run by a relative. Although he hardly knew how to read at the time, Elder Porphyrios had a copy of the Life of St John the Hut-Dweller which he read as a boy. St John inspired him. St John the Hut-Dweller was late fifth-century Constantinopolitan saint who secretly took up the monastic life at the famed monastery of the Acoimetae (Unsleeping Ones). After living for some years according to a very strict rule, St John was granted permission by his abbot to go life near his parents so as to cleanse his heart of earthly love for them. He then dwelled in a hut beside his family, identity unknown, for three years. He revealed himself to his mother on his deathbed. Young Evangelos was inspired by St John the Hut-Dweller’s story and wanted nothing more than to become a monk. He tried to run away to Mt Athos, the Holy Mountain, to become a monk on a few occasions. When he was 12, he succeeded at his goal and entered the life of obedience to two very strict and severe elders. At the age of 14, he became a monk under the name Niketas, and at 16 he took his full vows. During these early years of the monastic life, Elder Porphyrios was given no praise but many tasks. He spent much time alone on the mountain with no one but the birds. He learned the Psalms and the prayers by heart. And at age 19, he received a gift from the Holy Spirit of clear sight. When this gift came, he saw his elders approaching his position even though they were far away and around a corner. He knew what they were doing. Later in his life, Elder Porphyrios was able to use this gift of sight to counsel and care for the souls of the many people who came to him seeking God’s grace. One morning I was walking alone in the virgin forest. Everything, freshened by the morning dew, was shining in the sunlight. I found myself in a gorge. I walked through it and sat on a rock. Cold water was running peacefully beside me and I was saying the [Jesus] prayer. Complete peace. Nothing could be heard. After a while the silence was broken by a sweet, intoxicating voice singing and praising the Creator. I looked. I couldn’t discern anything. Eventually, on a branch opposite me I saw a tiny bird. It was a nightingale. I listened as the nightingale trilled unstintingly, its throat puffed out to bursting in sustained song. The microscopic little bird was stretching back its wings in order to find power to emit those sweetest of tones, and puffing out its throat to produce that exquisite voice. If only I had a cup of water to give it to drink and quench its thirst! Elder Porphyrios’ love of the animal world, and of birds in particular, is illustrated by his taming of two wild parrots later in life. He wished also to tame an eagle, but I don’t know if that happened. One of his parrots would say the Jesus Prayer with him. Ill health forced Elder Porphyrios to leave Mount Athos, and he returned to Evia where we lived at the Monastery of St Charalambos, Levka. In 1926 he was ordained priest and was given the name Porphyrios. He lived at the Monastery of St Charalambos for twelve years as a spiritual guide and confessor, and then three years at the deserted Monastery of St Nicholas in Ano Vatheia. 1940 saw the Second World War and Elder Porphyrios’ move to Athens. He became the chaplain and confessor at the Polyclinic Hospital where he served for many years, leading the liturgy and hearing confessions and ministering to the staff and patients of the hospital, many of whose previous contact with Christianity had been minimal or merely formal. From 1955 to 1979, he lived at the Monastery of St Nicholas in Kallisia. He was still chaplain at the Polyclinic, but he was now able to also live out his lifelong dream of being a monastic at the same time. In 1979, he moved to Milesi, a village that overlooks Evia, where he lived at first in a caravan and later in a single-cell built of cinder blocks. However, the goal of founding a monastery was realised, and in 1984 he was able to move into one of the rooms of the complex under construction, and in 1990 the foundation stone of the monastic church was laid. He returned to the Holy Mountain and died at his hermitage in Kavsokalyvia, where he had become a monk so long ago, December 2 1991. Stories about Elder St Porphyrios abound. One time, a young man on the verge of suicide received a phone call out of the blue, and it was the saint (neither knew each other) who counselled him not to kill himself. This young man was converted, and later met Elder Porphyrios before becoming a priest himself. One young woman had a vision of Elder Porphyrios while she, too, was contemplating suicide. At both these times, Elder Porphyrios had been at prayer when the Lord made the miracle happen. Imagine if more ministers were so drawn into Scripture that their hearts were pierced in the formality of Sunday services! This is not really the attitude we associate with the Middle Ages. We imagine the mediaeval man or woman being enthusiastic and obsessed with miracles, telling and retelling these wondrous tales, even making them up as in the case of Pope St Sylvester healing Constantine’s leprosy. We also imagine that the mediaeval mindset saw the miraculous as the primary evidence for sanctity. But for Turgot, it is Queen Margaret’s … well … sanctity that is the primary evidence. I’m not sure which approach is truly the more common in the Middle Ages, the caricature or Turgot’s. But it’s important to have our stereotypes about historical epochs challenged. Each person who lived through the Middle Ages was an individual with his or her own beliefs and emphases. Just like you. I like this miracle because it also challenges our ideas of mediaeval piety. Quite often we approach the piety of the Middle Ages through a lens that they were all relic-obsessed Mariolaters who barely gave Christ a thought and read saints’ lives instead of Scripture. Some likely were. I’ve a feeling most were not. This miracle, along with the bulk of what Turgot says about St Margaret of Scotland, serves to remind us of the word-centred nature of Queen Margaret’s holiness. 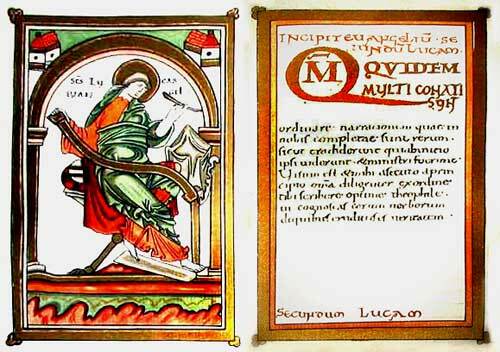 Her sanctity was founded upon the reading and reading of the Bible, especially of the Gospels. At the heart of her prayers was the Psalter — not only when she recited it in toto but also because it is the heart of the daily office which she prayed. I think this miracle of St Margaret’s Gospel Book is as much, if not more, about the holiness of the Scriptures as about the holiness of Queen Margaret. And that’s what good hagiography (the writing of saints’ lives) should do — point us from the saint to Christ, the Trinity, and the Scriptures. When I was a kid, my dad brought home a copy of the Oxford Dictionary of Saints by David Farmer from a clergy conference. It was probably the 3rd edition (1992), but maybe the 2nd (1987). I thought it was the most excellent thing ever, so I was quite pleased to buy my own copy of the 5th revised edition (2011) for half price from Blackwells last week. Since it’s the Octave of All Saints, here’s my review. As the front cover states, the book covers ‘the lives, cults, and associated art of more than 1,700 saints’. The immediate question, especially in our ecumenical age with western Christians becoming ever more aware of the eastern churches, is: Which 1,700? Since my dad’s edition (and probably since the first), the main focus of this book has been English saints — unsurprising, given it’s point of origin. However, it has now been expanded to include saints from North and South America. All English saints including those of English origin who died abroad … and those of foreign origin who died in England. All saints whose feasts are in the important calendars such as the Roman Calendar of 1969, the Book of Common Prayer, and the Sarum rite as well as those who are patrons of churches or places. The most important and representative saints of Ireland, Wales, and Scotland. Other saints have been included because of their importance of the history of the Christian Church. This gives us a range covering the English Venerable Bede, Augustine of Canterbury, and Willibrord, as well as Fathers such as Ambrose, Augustine of Hippo, and John Chrysostom, and modern saints such as Mary Mackillop, Gemma Galgani, and Thérèse of Lisieux, and pre-schism eastern saints such as John Climacus, Maximus the Confessor, and Theodore the Studite. The inclusion of Prayer Book saints means that Margaret of Antioch and Catherine of Alexandria, despite suppression by the papacy in 1969, are here. Unfortunately, Canada seems barely to exist in this book. Kateri Tekakwitha is not here, and of the eight Canadian Martyrs only Jean de Brébeuf and Isaac Jogues are present. Canada is also not included in the list of countries and places with their patron saints. Given that the book has tried to become global by including African, South American, and Asian saints, it is a bit disappointing to see it lacking Canadians. The next question, after considering the range of saints included, is whether the entries are any good. I believe the answer is yes. Each entry begins with the saint’s dates and a brief mention such as ‘monk and bishop of Lindisfarne.’ Then follows a brief, critical biography that mentions the activities and reputed character of the saint as well as miracles performed within his or her lifetime with neither accepting all miracle tales outright nor rejecting them out of hand. In the case of a saint such as Cuthbert, there follows a long discussion of what happened to the body/relics and the establishment of the saint’s cultus, possibly also where mediaeval artwork concerning the saint is to be found. The entry proper closes with the saint’s feast day. Then Farmer gives a brief bibliography of both primary and secondary sources for the saint’s life, and where the works of saints who were writers may be found. Sometimes I think mentions of English translations would be useful, but the critical engagement of each entry is to be lauded. The Introduction to the volume discusses the origins of the cult of the saints, then its progress in the British Isles in the Early Middle Ages, and then the development of the system in the Roman Church from the High Middle Ages to today including the fate of the cults during the Reformation. There is a brief bibliography as well as footnotes throughout the Introduction. A series of appendices close the book. Appendix 1 covers ‘Principal Patronages of Saints’ — Matthew, my namesake, is the patron of accountants, while Bede and Jerome are the patrons of scholars. Appendix 2 is very helpful, ‘Principal iconographical emblems of saints.’ With this knowledge in hand, one can more easily identify saints in art. Interesting entries: ‘Breasts (on dish) Agatha’, ‘Eyes (on dish) Lucy’, ‘Eyes (on book) Odile’, and ‘Intestines Erasmus’. Appendix 3 is a useful discussion of ‘Pilgrimages’, accompanied by maps of pilgrim sites in Britain and Ireland, Europe, the Holy Land, and North and South America. Then follows an Index of Places, a Calendar, and Patron Saints of Countries and Towns. Finally, this book is ‘Web Linked.’ This means that OUP has a web page of useful links about saints to accompany this book, undoubtedly chosen and recommended by Farmer. The page includes links to resources on Benedictines, Cardinal Newman, some general saints websites, Celtic saints, Greek Orthodox saints, the Marist Brothers, the Crusades, the Bollandists, Mary Mackillop, and a link to the Vatican’s website. Overall, this book is a very handy resource and I highly recommend it. Its gaps are disappointing but few. Maybe the 6th Edition will have more Canadians. 😉 Otherwise, it covers in a brief yet critical way that opens the reader up to further reading most of the saints that interest me from the Patristic and Insular world. I have blogged about St Antony and his Life published (if not composed) by St Athanasius before, as visible on the Desert Fathers page of this site. When we come in front a text such as the Life of St Antony, the questions that tend to confront us — especially if philosophical materialists (matter is all there is) — are manifold. How much of this is even true? We have Antony visible wrestling with invisible opponents. The sick are cured. Demons are cast out. People hear the disembodied voices of the demons as they tempt Antony. He lives for twenty years alone on a sparse diet but is as hale and hearty as ever when he comes out of seclusion. He has visions both of demons and of Christ. People who want to determine whether an account is true or not tend to dissect things on their likelihood as well as how well attested they are. The likelihood of any miracle is, by definition, scanty. And our evidence for Antony’s miracles primarily comes from this text written probably by an Alexandrian and certainly serving the polemical purposes of Athanasius vs. the ‘Arians’ — if the Nicenes can produce such a saint, how could they be wrong? Of course, one could easily point to the vast wealth of material that gives us miracle stories, exorcisms, and visions in the acts of the martyrs and lives of later saints. Perhaps these could be used as a bar — people in similar circumstances do similar things. May these miracles be not so unlikely after all? However, immediately it will be pointed out that the earlier stories are unreliable because they were often written after the fact and clearly embellished to promote the Christian message. And the later stories are clearly modelling themselves on the Life of St Antony. Therefore, the argument that holiness manifests itself in similar ways throughout history will not convince our imagined materialist. In fact, short of witnessing such a miracle oneself, I don’t think that a confirmed materialist could ever be convinced that the Life of Antony is 100% true. Furthermore, the apparatus of historical investigation cannot either prove or disprove the events recounted in this story. ‘Likelihood’ cannot be used as a criterion if the miraculous is in play, short of discounting all miracles (as the materialist will). What use, then, is the Life of Antony? We cannot prove it true. We cannot prove it false. What do we do with it? We must ask ourselves why the text was written in the first place and for whom it was written. It claims to have been written by Athanasius to provide the ideal monastic lifestyle for the reading pleasure and edification of his fellow clergy. The point of the Life of Antony is not historical information but edifying example. Therefore, what this text shows us is what this particular Egyptian community — Alexandrians who admired the Desert Fathers, perhaps the Desert Fathers themselves a bit — values and strives towards. These people value commitment to Christ above all. They value what Franciscans will later call ‘evangelical poverty.’ They value constant prayer. They believe in demons but also in the greater power of Christ at work in the Christian to overcome the demons. These things and more are what we can take away from this text. At this point, when we look to it as reflective of a particular historical community rather than a straight historical narrative, the Life of St Antony takes on a different force and becomes disturbing in a new way. Rather than challenging the philosophical materialist (matter is all there is), it aims for the heart of the practical materialist (matter is all that matters). This is the value, historical and philosophical, of documents such as the Life of St Antony. These are the questions we should ask them — questions that will provoke the text to question us as well. There is no reason to disbelieve the Ascension in the face of modern astronomy and physics. This is the thing that’s been nagging at me about the Ascension since a comment someone made at Christmastide that everyone’s friend J S Spong says that if Jesus really ascended, he’d still be going up. And then on the Sunday following Ascension, the minister where I was worshipping carefully passed over talking about the literalness of the Ascension to talk about its meaning for our Christian lives today (fair enough) — which prompted someone at coffee hour to comment that the feet in the ceiling of the Chapel of the Ascension in Walsingham was the height of fundamentalism. Perhaps she meant that spatially. Moving on, then, to Spong and other suchlike folks. There is no reason to assume that if the Ascension occurred, Jesus just kept on going. None of us believes that Heaven is ‘somewhere up there’. If the Kingdom of the Heavens is in our midst, then it is another sphere of being that overlaps with ours. Even in Dante’s Paradiso, you cannot reach the Primum Mobile and the Throne Room of Heaven simply by going up. It is a spiritual realm. For Jesus to get there, he will have to have crossed the boundary between the physical and the spiritual worlds, into the realm reserved for the numinous and luminous. Therefore, I have no difficulty imagining Jesus having ascended. Indeed, it makes the most sense to me. Had he simply vanished from sight, the Apostles may have expected him to come back a few days later. In the Forty Days after Easter, he did have a tendency to do odd things, like vanish into thin air or walk through walls. ** Therefore, to make his point and make it dramatically, he ascended from the Apostles. And then, when the cloud covered him (as in Acts 1), he took his glorified, human body to the Throne Room of Heaven. It’s not that hard to imagine. It’s not that hard to believe. The physics of the Ascension have nothing to do with modern vs. pre-modern, of Ptolemaic astronomy vs. Copernican astronomy vs. Einstein. Finally, if perhaps you still aren’t sure, there is always C S Lewis’ remarks in Miracles, where he observes that, since Heaven is not ‘up there’, but possibly imagined as being such by a first-century fisherman, when Jesus did actually have his final leavetaking of this Earth in his physical body, the only way the disciples could describe it was by him ascending, regardless of what actually went on. Truly it was a great and indescribable source of rejoicing when, in the sight of the heavenly multitudes, the nature of our human race ascended over the dignity of all heavenly creatures, to pass the angelic orders and to be raised beyond the heights of archangels. In its ascension it did not stop at any other height until this same nature was received at the seat of the eternal Father, to be associated on the throne of the glory of that One to whose nature it was joined in the Son. Since the Ascension of Christ is our elevation, and since, where the glory of the Head has preceded us, there hope for the body is also invited, let us exult, dearly beloved, with worthy joy and be glad with a holy thanksgiving. Today we are established not only as possessors of Paradise, but we have even penetrated the heights of the heavens in Christ, prepared more fully for it through the indescribable grace of Christ which we had lost through the ill will of the devil. Those whom the violent enemy threw down from the happiness of our first dwelling, the Son of God has placed, incorporated within himself, at the right hand of the Father, the Son of God who lives and reigns with God the Father Almighty and with the Holy Spirit forever and ever. Amen. (Sermon 1 on the Ascension [Serm. 73]), trans. Freeland and Conway for Fathers of the Church). This is the mystical vision of true orthodoxy. God became man so that man might become God. Therein lies the true message and mystery of the Ascension. *This relates to my frustrations with people who think that Handel’s Creation/Die Schöpfung is ‘naïve’ because it takes Genesis literally. And, given the mediaeval propensity toward allegory, does everyone actually think that they all believed in a literal Garden when scribes made illuminations? To take a powerful story that carries with it spiritual weight and express it artistically is not the same as, say, this website. **This is because he was more real, not less. As a more substantial being, a wall was as nothing to his glorified flesh. C S Lewis observes this somewhere, but I picked it up from the Rev. George Sinclair. Definitive Proof that the Tome of Leo is True! Anyway, Moschos was of the Chalcedonian persuasion, and every once in a while his miracle stories provide corroboration of the truth of the Chalcedonian tradition, such as visions of heretics burning in hell, or miracles involving the Eucharist consecrated by Chalcedonian priests. The usual. I am not sure how old the story is; likely not much older than Moschos. Moschos’ stories that affirm Chalcedon in The Spiritual Meadow are the same sort of thing the Monophysites had in John Rufus’ Plerophoriae. By gaining St. Peter’s apostolic stamp of approval, the Tome is declared to be authoritative. Anyone who doubts can rest at ease knowing that the imperial church is in the good books of the Prince of the Apostles. This sort of Chalcedonian affirmation in Moschos is very different from that in Cyril of Scythopolis, where the defence of Chalcedon comes in the form of speeches made by his monks. Yet both methods are in keeping with the general tone of each author. While Cyril includes some miracle stories, Moschos includes almost nothing but, save when he drops in the occasional apophthegm. Cyril gives us complete biographies, Moschos flashes of light in time. They both produce for us discours hagiographique, but each is very different from the other, Moschos going for flare, Cyril going for the more “down-to-earth”. *This translation constantly refers to people unrolling books; I’ll have to check the Greek, for I can think of no reason why people would be using scrolls at so late a date.